respiratory system disorders and mastitis. Hypersensitivity to flumethasone or any of the components of the product. General contraindications for the use of glucocorticosteroids also apply to Vecort. Do not use the drug in cases of: stomach and intestinal ulcers, viral infections, systemic mycoses, pregnancy, hypocalcaemia, osteoporosis, cataracts, glaucoma, poorly healing wounds. 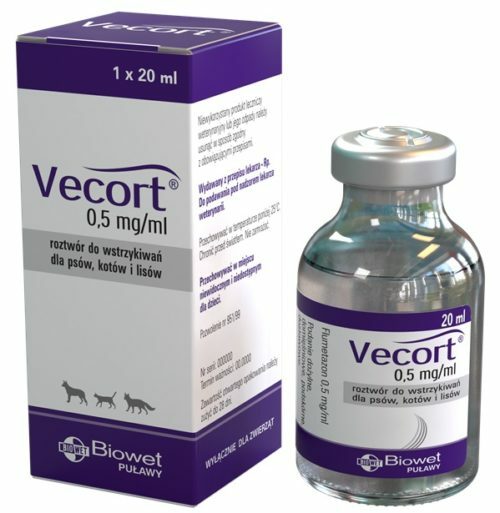 Vecort should not be used in the case of bacterial infections until an effective antibiotic therapy has been applied. Like all medicines, Vecort can cause adverse reactions. An increased demand for water, polyuria and increased appetite may occur. Stomach and intestinal ulcerations, osteoporosis, growth retardation in young animals may occur. Glucocorticosteroids can cause reversible damage to the liver, hypertension, increased risk of thrombosis, development of cataract, prolonged wound healing. In long-term treatment with glucocorticosteroids, iatrogenic Cushing’s syndrome may occur. Long-term glucocorticosteroid therapy may cause immunosuppression. A prolonged use of the drug leads to a decrease in adrenal cortex activity and may even lead to atrophy. Administration of glucocorticosteroids may affect the results of blood laboratory tests causing: increased activity of alkaline phosphatase, increased glucose concentration, decreased concentration total and free T4, leucocytosis. Glucocorticosteroids affect the results of tests that assess the activity of the hypothalamo-pituitary-adrenal system and the results of allergic skin tests. The occurrence of adverse reactions after the administration of this product, or any observed symptoms that cause worry not mentioned in the leaflet (including human reactions due to contact with the medicine), must be reported to a competent veterinarian, the holder of the authorisation or the Office for Registration of Medicinal Products, Medical Devices and Biocidal Products. 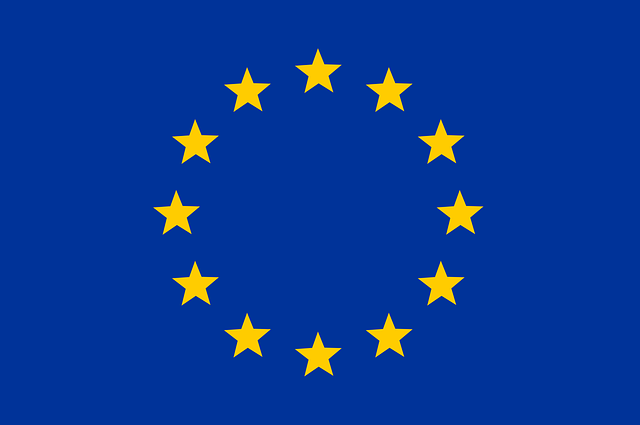 A notification form is to be downloaded at http://www.urpl.gov.pl (Veterinary Medicinal Products Division). The product is administered once; in justified cases, the dose may be repeated after 3 days. Do not store above 25°C. Protect from light. Shelf-life after the first opening of the packaging: 28 days. Do not use this veterinary medicinal product after the expiry date which is stated on the label. The expiry date refers to the last day of that month. Caution should be exercised when using the product in animals with heart failure, diabetes and chronic renal failure. Special precautions for persons administering the veterinary medicinal product to animals: Protect eyes before being exposed to the product. In case of accidental self-injection, immediately seek doctor’s advice and present the doctor with the information leaflet or package. Do not use during the whole or part of the pregnancy and in lactating females. Glucocorticosteroids administered in combination with cholinesterase inhibitors may cause increased muscle weakness. Administrated with anticoagulants may reduce or increase their effect. Administered with diuretics and amphotericin B, they may increase the risk of hypokalemia. Used in combination with ephedrine, estrogens, ketoconazole and macrolide antibiotics may intensify and prolong the activity of glucocorticosteroids. Administered together with phenobarbital, phenytoin and rifampicin may weaken the effect of glucocorticosteroids. Glycocorticosteroids weaken the effect of insulin. The combined use of theophylline and glucocorticosteroids changes the activity of both drugs. Glucocorticosteroids should not be used in combination with non-steroidal anti-inflammatory drugs because of the increased risk of gastric ulceration. Glycocorticosteroids increase the risk of poisoning with drugs such as cyclosporine, erythromycin or cardiac glycosides. The use of glucocorticosteroids should be avoided with vaccines containing live attenuated viruses, as this may lead to increased virus replication. Overdose may cause a decrease in immunity and, consequently, a growing risk of bacterial, fungal and viral infection. Multiple high doses of glucocorticosteroids may lead to the occurrence of iatrogenic Cushing syndrome (polyuria, polydypsia, polyphagia, truncal obesity, liver enlargement, saggy stomach, hair loss – often symmetrical, thinning of the skin and visible vessels – especially on the abdomen, excessive pigmentation, skin calcifications, muscle weakness and atrophy). Sudden discontinuation of glucocorticosteroids after prolonged treatment (more than 2 weeks) may cause glucocorticosteroid withdrawal syndrome (Addison’s disease). Medicines should not be disposed of via wastewater or with household waste. Ask your veterinary surgeon how to dispose of unusable medicines. They will ensure better environmental protection. For any information about this veterinary medicinal product, please contact the marketing authorisation holder. A single 20 ml clear glass bottle, packed individually in a cardboard box.